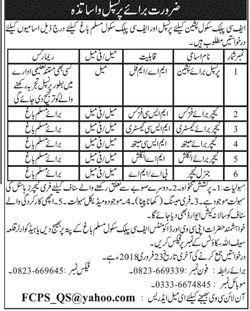 FC Public School Pasheen & FC Public School Muslim Bagh has announced New Jobs in Daily Jang Newspaper 13 February 2018. Candidates fulfilling the required criteria may apply for these new jobs by sending their applications to the office of FC Public School Muslim Bagh before last date. Candidates can apply for Principal, Teacher for Physics, Teacher for Chemistry, Teacher for Math, Teacher for English and General Teacher. Free Teacher Hostel Facility & Mess Accommodation will be given to outsider of the Province.